Kind of says it all huh? Hmmmmm…..good advice. Though sometimes one person can do all three of those things. Um how can they leave u n help u? Help then leave later. Some people start out okay, but change later. They don’t actually change. They just start showing you who they really are. 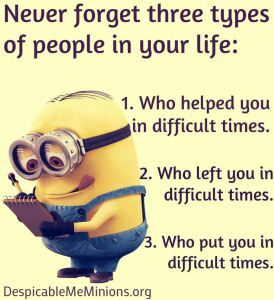 I wonder why that remembering the last one hardest to do. In my case it is more about the pathological nature of my family. Learning how to undo the damage that abusive childhoods induce is a lifetime process; at least for me. Thanks for the post.